salts, and amino acids. Its composition varies depending on geography and climate. This product gets its name from the fact that bees use it for the development and nurturing of queen bees. Some people use royal jelly as medicine. Don’t confuse royal jelly with bee pollen or bee venom. Royal jelly is used for asthma, hay fever,liver disease, pancreatitis, sleep troubles(insomnia),premenstrual syndrome(PMS),stomach ulcers,kidney disease, bonefractures, menopausal symptoms, skin disorders, and high cholesterol. It is also used as a general health tonic, for fighting the effects of aging, and for boosting the immune system. Some people apply royal jelly directly to the skin as a tonic or to the scalp to encouragehair growth. Graves Disease :Royal jelly is believed to be potentially beneficial to patients with Graves’ disease. One study found that royal jelly has the ability to stimulate the growth of neural stem cells and glial cells in the brain, which may mean that it can help prevent diseases such as Alzheimer’s and Parkinson’s disease. Cholesterol: Studies have found that royal jelly has the ability to lower total serum cholesterol levels in people with moderately elevated cholesterol levels. Anti-Aging:It is believed to have anti-aging properties, improving collagen production in skin and overall youthfulness. Anti-Inflammatory: It has been shown to have anti-inflammatory properties when ingested and when applied topically. Research has found that royal jelly has wound healing properties when applied topically to the skin. Antibiotic :Royal jelly contains an antibiotic called 10-Hydroxy-Dgr2-decenoic acid that is effective against many bacteria. 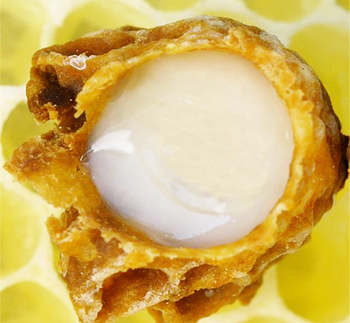 Research in Japan suggests that royal jelly has strong anti-cancer properties. Croatian researchers found that royal jelly injected into mice at the same time that they were injected with cancer cells significantly reduced the spread of cancer. 29 amino acids that have been identified, the most important is aspartic acid and glutamic acid. Sugars consist mainly of fructose and glucose.The proportion of lipids is a very interesting feature of royal jelly. The lipids consisting mainly of fatty acids, among which the most important is the hydroxytransdecenoic acid (10-HDA), which has antibacterial and fungicidal properties. • The main minerals it contains are: K, Ca, Na, Zn, Fe, Cu and Mn. Characteristic for the royal jelly is the content of vitamins such as B1, B2, B3, B4, B5, B6, B7, B8, B9, B12 and in smaller quantities C, D, A and E. It also contains active substances, such as acetylcholine, which has vasodilative properties, useful for the treatment of circulatory disorders. The range of analytical values of royal jelly is due to several factors such as the collection area, the different plants, the breed of bees, the age of the larva of which it is collected, the storage conditions,etc.